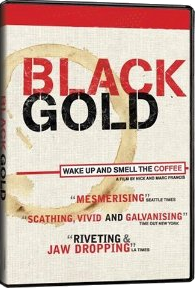 Documentary about the international coffee trade. Partly it just follows Tadesse Meskela, the head of an Ethiopian fair trade coffee co-operative around as he explains the coffee business, including its economics. You get to see the actual coffee farmers and how they live, literally starving to death. You see wraith-like children with legs so skinny they look like space beings. It is like movies from Hitler’s death camps, only in colour. It then cuts to tubby Americans and Europeans guzzling coffee at hugely inflated prices in tony coffee shops. The growers are not stupid at all. They eloquently make the case to the camera for paying them a fair price for coffee. You find out what utter bastards the big coffee companies like Nestlés are. Their greed, ruthlessness and crueltly is beyond belief. They make Ebenezer Scrooge look like Santa Claus. See the website blackgoldmovie.com.